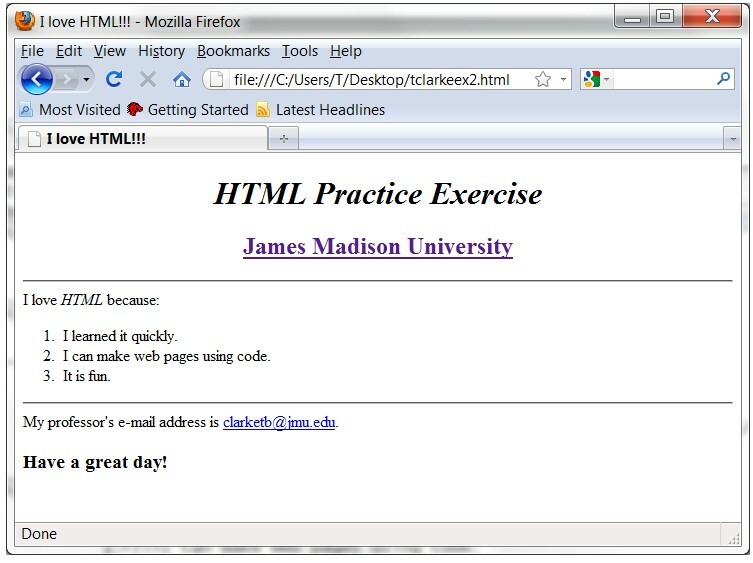 July 20, 2011 by Theresa B. Clarke 3 comments on "HTML Practice Exercises"
The objective of this exercise is to help you practice using HTML tags to code a basic web page. Start by creating a new .html file in notepad. A bit of colored text somewhere on the page using one or more of the colors on the browser-safe color palatte or HTML color names. For this exercise, you should select an image that is already existing on the web. Once you find an image, you want to find the associated URL and point to it from your web page. To point to an image on the web, right click the image, view the image information, copy and paste the image’s URL into notepad using the correct HTML tags. Look at the image of the web page below. Using HTML coding, replicate the page exactly. Save the file with your first initial and full last name and ex2 (correct example: tclarkeex2.html). Your file name should have NO spaces. The hypertext links for James Madison University and clarketb@jmu.edu must be working links. Don’t forget to include the title by putting the phrase “I Love HTML!! !” in your title tag. Tip: There is one of each in the coding – H1, H2, and H3. Do not use the font size and bold tags. The title tag should not be bold, even thought looks bold in the tab on the screenshot. HTML Practice Exercises by Theresa B. Clarke is licensed under a Creative Commons Attribution-NonCommercial-NoDerivs 3.0 Unported License. 3 Comments on "HTML Practice Exercises"
I am teaching a high school computer science class. We are starting a unit on HTML. I would like to link to your exercises for use in class. Can you tell me if that is ok with you, and if it is, how to access the web page referred to in exercise 2. You are welcome to provide a link to this exercise. In terms of the web page referred to in exercise 2, that is just a screen shot of a page created in HTML. It is not a live page. Let me know if you have any further questions. Hi! this article is very helpful. Can you send me more exercises? thanks.